But Aether’s not done with her—or Adam, or fellow survivor Chris. The travelers on Aether’s latest mission to the future have gone missing, and Elena and her friends are drafted into the rescue effort. They arrive in a future that’s amazingly advanced, thanks to Aether Corporation’s reverse-engineered technology. The mission has deadly consequences, though, and they return to the future to try to alter the course of events. But the future is different yet again. Now every trip through time reveals new complications, and more lives lost—or never born. Elena and Adam must risk everything—including their relationship—to save their friends. Future Shock was a fast-paced, time-travel mystery full of twists and turns (review here), and I was excited to see where the sequel, Future Threat, would go after finishing it last year. 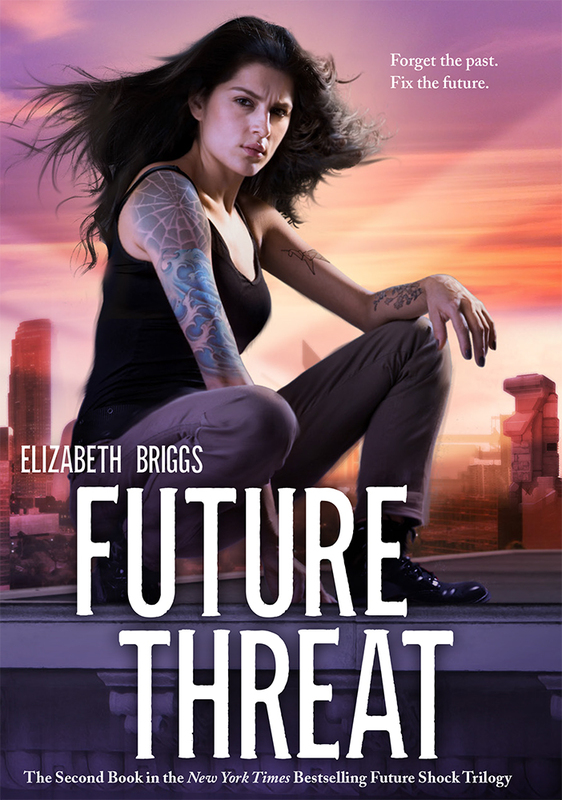 Future Threat picks up six months after Future Shock ended with Elena, Adam, and Chris dealing with the aftermath of what happened in book one. They thought they were done with Aether Corp for good, but just when they thought they were out, they are pulled back in. Aether sends Elena, Adam, and Chris again into the future in order to save another group of teenagers who have been making trips into the future. After their mission goes horribly wrong, Elena and crew are sent back to the future for another time in order to try to fix their mistakes from their previous mission. Time-travel books can be hard to pull off, but Elizabeth Briggs succeeds again with Future Threat. I loved seeing the different futures that were created based off of the different choices Elena and crew made. These parallel worlds were interesting and conjured up so many questions. I was able to predict the outcome of the mystery fairly early in Future Shock, so I loved that the new mystery kept me on the edge of my seat while trying to guess what happens next. I really enjoyed the diverse cast of characters in Future Shock and was happy with the new additions that were introduced. Overall, Future Threat was a strong sequel to Future Shock and I look forward to reading the last installment of this thriller time-travel trilogy next year.